Excavated ruins at Ras Shamra. 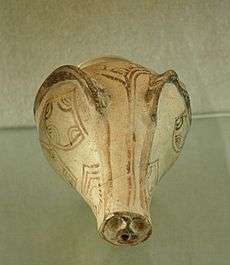 Boar rhyton, Mycenaean ceramic imported to Ugarit, 14th–13th century BC (Louvre). Ugarit (/ˌuːɡəˈriːt, ˌjuː-/; Ugaritic: 𐎜𐎂𐎗𐎚, ʼUgart; Arabic: أُوغَارِيت‎‎ Ūġārīt, alternatively Arabic: أُوجَارِيت‎‎ Ūǧārīt) was an ancient port city, the ruins of which are located at what is now called Ras Shamra (sometimes written "Ras Shamrah"; Arabic: رأس شمرة‎‎, literally "Cape Fennel"), a headland in northern Syria. 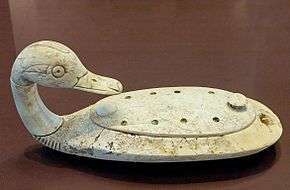 Ugarit had close connections to the Hittite Empire, sent tribute to Egypt at times, and maintained trade and diplomatic connections with Cyprus (then called Alashiya), documented in the archives recovered from the site and corroborated by Mycenaean and Cypriot pottery found there. The polity was at its height from c. 1450 BC until 1200 BC. 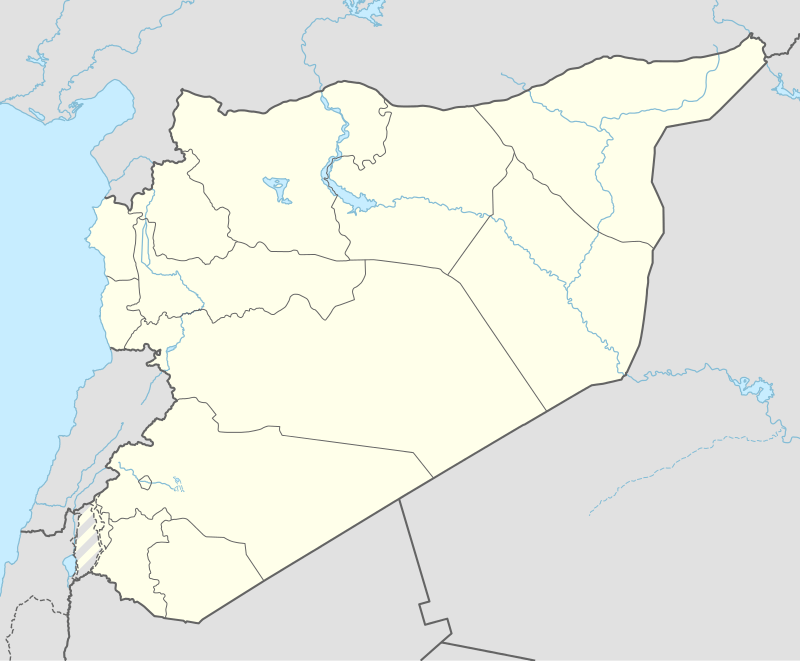 Ras Shamra lies on the Mediterranean coast, some 11 kilometres (7 mi) north of Latakia, near modern Burj al-Qasab. Neolithic Ugarit was important enough to be fortified with a wall early on, perhaps by 6000 BC, though the site is thought to have been inhabited earlier. Ugarit was important perhaps because it was both a port and at the entrance of the inland trade route to the Euphrates and Tigris lands. The city reached its heyday between 1800 and 1200 BC, when it ruled a trade-based coastal kingdom, trading with Egypt, Cyprus, the Aegean, Syria, the Hittites, and much of the eastern Mediterranean. The first written evidence mentioning the city comes from the nearby city of Ebla, c. 1800 BC. Ugarit passed into the sphere of influence of Egypt, which deeply influenced its art. Evidence of the earliest Ugaritic contact with Egypt (and the first exact dating of Ugaritic civilization) comes from a carnelian bead identified with the Middle Kingdom pharaoh Senusret I, 1971–1926 BC. A stela and a statuette from the Egyptian pharaohs Senusret III and Amenemhet III have also been found. However, it is unclear at what time these monuments were brought to Ugarit. Amarna letters from Ugarit c. 1350 BC record one letter each from Ammittamru I, Niqmaddu II, and his queen. From the 16th to the 13th century BC, Ugarit remained in regular contact with Egypt and Alashiya (Cyprus). In the second millennium BC, Ugarit's population was Amorite, and the Ugaritic language probably has a direct Amoritic origin. The kingdom of Ugarit may have controlled about 2,000 km2 on average. During some of its history it would have been in close proximity to, if not directly within the Hittite Empire. My father, behold, the enemy's ships came (here); my cities(?) were burned, and they did evil things in my country. Does not my father know that all my troops and chariots(?) are in the Land of Hatti, and all my ships are in the Land of Lukka? ... Thus, the country is abandoned to itself. May my father know it: the seven ships of the enemy that came here inflicted much damage upon us. However, no help arrived, and the city was burned to the ground at the end of the Bronze Age. By excavating the highest levels of the city's ruins, archaeologists can study various attributes of Ugaritic civilization just before their destruction, and compare artifacts with those of nearby cultures to help establish dates. Ugarit also contained many caches of cuneiform tablets, actual libraries that contained a wealth of information. The destruction levels of the ruin contained Late Helladic IIIB pottery ware, but no LH IIIC (see Mycenaean period). Therefore, the date of the destruction of Ugarit is important for the dating of the LH IIIC phase in mainland Greece. Since an Egyptian sword bearing the name of pharaoh Merneptah was found in the destruction levels, 1190 BC was taken as the date for the beginning of the LH IIIC. A cuneiform tablet found in 1986 shows that Ugarit was destroyed after the death of Merneptah (1203 BC). It is generally agreed that Ugarit had already been destroyed by the 8th year of Ramesses III (1178 BC). Recent radiocarbon work indicates a destruction date between 1192 and 1190 BC. Whether Ugarit was destroyed before or after Hattusa, the Hittite capital, is debated. The destruction was followed by a settlement hiatus. Many other Mediterranean cultures were deeply disordered just at the same time, apparently by invasions of the mysterious "Sea Peoples". Ammurapi c. 1200 BC Contemporary of Chancellor Bay of Egypt. Ugarit is destroyed. Scribes in Ugarit appear to have originated the "Ugaritic alphabet" around 1400 BC: 30 letters, corresponding to sounds, were inscribed on clay tablets; although they are cuneiform in appearance, that is, impressed in clay with the end of a stylus, they bear no relation to Mesopotamian cuneiform signs. A debate exists as to whether the Phoenician or Ugaritic "alphabet" was first. While the letters show little or no formal similarity, the standard letter order (preserved in the Latin alphabet as A, B, C, D, etc.) shows strong similarities between the two, suggesting that the Phoenician and Ugaritic systems were not wholly independent inventions. The existence of the Ugaritic language is attested to in texts from the 14th through the 12th century BC. Ugaritic is usually classified as a Northwest Semitic language and therefore related to Hebrew, Aramaic, and Phoenician, among others. Its grammatical features are highly similar to those found in Classical Arabic and Akkadian. It possesses two genders (masculine and feminine), three cases for nouns and adjectives (nominative, accusative, and genitive); three numbers: (singular, dual, and plural); and verb aspects similar to those found in other Northwest Semitic languages. The word order in Ugaritic is verb–subject–object, subject-object-verb (VSO)&(SOV); possessed–possessor (NG) (first element dependent on the function and second always in genitive case); and noun–adjective (NA) (both in the same case (i.e. congruent)). Apart from royal correspondence with neighboring Bronze Age monarchs, Ugaritic literature from tablets found in the city's libraries include mythological texts written in a poetic narrative, letters, legal documents such as land transfers, a few international treaties, and a number of administrative lists. Fragments of several poetic works have been identified: the "Legend of Keret", the "Legend of Danel", the Ba'al tales that detail Baal-Hadad's conflicts with Yam and Mot, among other fragments. The discovery of the Ugaritic archives in 1929 has been of great significance to biblical scholarship, as these archives for the first time provided a detailed description of Canaanite religious beliefs, during the period directly preceding the Israelite settlement. These texts show significant parallels to Hebrew biblical literature, particularly in the areas of divine imagery and poetic form. Ugaritic poetry has many elements later found in Hebrew poetry: parallelisms, metres, and rhythms. The discoveries at Ugarit have led to a new appraisal of the Hebrew Bible as literature. The important textual finds from the site shed a great deal of light upon the cultic life of the city. 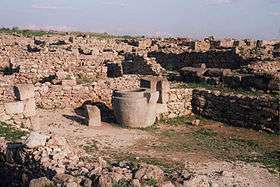 The foundations of the Bronze Age city Ugarit were divided into quarters. In the north-east quarter of the walled enclosure, the remains of three significant religious buildings were discovered, including two temples (of the gods Baal Hadad and Dagon) and a building referred to as the library or the high priest's house. Within these structures atop the acropolis numerous invaluable mythological texts were found. These texts have provided the basis for understanding of the Canaanite mythological world and religion. The Baal cycle represents Baal Hadad's destruction of Yam (the god of chaos and the sea), demonstrating the relationship of Canaanite chaoskampf with those of Mesopotamia and the Aegean: a warrior god rises up as the hero of the new pantheon to defeat chaos and bring order. 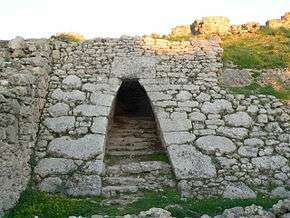 After its destruction in the early 12th century BC, Ugarit's location was forgotten until 1928 when a peasant accidentally opened an old tomb while ploughing a field. The discovered area was the necropolis of Ugarit located in the nearby seaport of Minet el-Beida. Excavations have since revealed a city with a prehistory reaching back to c. 6000 BC. The site is a sixty-five foot high mound. Archaeologically, Ugarit is considered quintessentially Canaanite. A brief investigation of a looted tomb at the necropolis of Minet el-Beida was conducted by Léon Albanèse in 1928, who then examined the main mound of Ras Shamra. But in the next year scientific excavations of Tell Ras Shamra were commenced by archaeologist Claude Schaeffer from the Musée archéologique in Strasbourg. Work continued under Schaeffer until 1970, with a break from 1940 to 1947 because of World War II. The excavations uncovered a royal palace of ninety rooms laid out around eight enclosed courtyards, and many ambitious private dwellings. Crowning the hill where the city was built were two main temples: one to Baal the "king", son of El, and one to Dagon, the chthonic god of fertility and wheat. 23 stelae were unearthed: nine stelae, including the famous Baal with Thunderbolt, near the Temple of Baal, four in the Temple of Dagon and ten more at scattered places around the city. On excavation of the site, several deposits of cuneiform clay tablets were found; all dating from the last phase of Ugarit, around 1200 BC. These represented a palace library, a temple library and—apparently unique in the world at the time—two private libraries, one belonging to a diplomat named Rapanu. The libraries at Ugarit contained diplomatic, legal, economic, administrative, scholastic, literary and religious texts. Various tablets are written in Sumerian, Hurrian, Akkadian (the language of diplomacy at this time in the ancient Near East), and Ugaritic (a previously unknown Northwest Semitic language). No less than seven different scripts were in use at Ugarit: Egyptian and Luwian hieroglyphs, and Cypro-Minoan, Sumerian, Akkadian, Hurrian, and Ugaritic cuneiform. Unique among the texts in Ugaritic are the earliest known abecedaries, lists of letters in alphabetic cuneiform, where not only the canonical order of Hebrew-Phoenician script is evidenced, but also the traditional names for letters of the alphabet. During excavations in 1958, yet another library of tablets was uncovered. These were, however, sold on the black market and not immediately recovered. The "Claremont Ras Shamra Tablets" are now housed at the Institute for Antiquity and Christianity, School of Religion, Claremont Graduate University, Claremont, California. They were edited by Loren R. Fisher in 1971. After 1970, succeeding Claude Schaeffer were Henri de Contenson, followed by Jean Margueron, Marguerite Yon, then Yves Calvet and Bassam Jamous, who since 2005 has held the office of Director General of Antiquities and Museums. In 1973, an archive containing around 120 tablets was discovered during rescue excavations; in 1994 more than 300 further tablets dating to the end of the Late Bronze Age were discovered within a large ashlar masonry building. The most important literary document recovered from Ugarit is arguably the Baal cycle, describing the basis for the religion and cult of the Canaanite Baal. There are also among the religious texts the Hurrian songs, including a noteworthy hymn to the moon goddess Nikkal, the oldest surviving substantial musical notation in the world. Its music is a series of 2-toned intervals played upon a 9-string lyre. These tablets reveal parallels between ancient Canaanite and Israelite practices; for example, levirate marriage, giving the eldest son a larger share of the inheritance or redeeming the first-born son were practices common to the people of Ugarit. ↑ Bahn, Paul (1997). Lost Cities: 50 Discoveries in World Archaeology. London: Barnes & Noble. pp. 98–99. 1 2 Pardee, Dennis. "Ugaritic", in The Ancient Languages of Syria-Palestine and Arabia (2008) (pp. 5–6). Roger D. Woodard, editor. Cambridge University Press, ISBN 0-521-68498-6, ISBN 978-0-521-68498-9 (262 pages). ↑ Stanislav Segert, A basic Grammar of the Ugaritic Language: with selected texts and glossary (1984) 1997. ↑ Nick Wyatt. Religious texts from Ugarit, (1998) rev. ed 2002. ↑ Gregorio Del Olmo Lete, Canaanite Religion: According to the Liturgical Texts of Ugarit, 2004. ↑ Yon, Marguerite (2006). The City of Ugarit at Tell Ras Shamra. Singapore: Eisenbrauns. p. 15. ISBN 978-1-57506-029-3. Retrieved 16 May 2015. ↑ Caubet, Annie. "Stela Depicting the Storm God Baal". Musée du Louvre. Retrieved 27 October 2012. ↑ Aaron Demsky, 1977. "A Proto-Canaanite Abecedary dating from the period of the Judges and its implications for the history of the Alphabet", Tel Aviv 4:47ff. ↑ See Prof Anne D. Kilmer. 1984. "A Music Tablet from Sippar(? ): BM 65217 + 66616". Iraq 46:69–80. This covers all 6 readable tablets up to that time. William M. Schniedewind, Joel H. Hunt, 2007. A primer on Ugaritic: language, culture, and literature ISBN 0-521-87933-7 p. 14. Caquot, André & Sznycer, Maurice. Ugaritic Religion. Iconography of Religions, Section XV: Mesopotamia and the Near East; Fascicle 8; Institute of Religious Iconography, State University Groningen; Leiden: E.J. Brill, 1980. Gibson, J.C.L., originally edited by G.R. Driver. 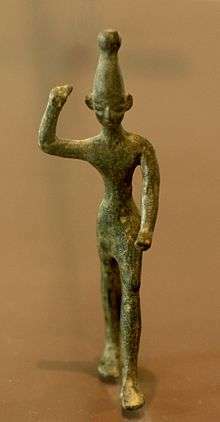 Canaanite Myths and Legends. Edinburgh: T. and T. Clark, Ltd., 1956, 1977. L'Heureux, Conrad E. Rank Among the Canaanite Gods: El, Ba'al, and the Repha'im. Harvard Semitic Museum, Harvard Semitic Monographs No. 21, Missoula MT: Scholars Press, 1979. Mullen, E. Theodore, Jr. The Assembly of the Gods: The Divine Council in Canaanite and Early Hebrew Literature. Harvard Semitic Museum, Harvard Semitic Monographs No. 24, Cambridge, MA: Harvard Press, 1980/ Atlanta, GA: Scholars Press Reprint, 1986. (comparison of Ugaritic and Old Testament literature). Smith, Mark S. The Ugaritic Baal Cycle: Volume 1. Introduction with Text, Translation and Commentary of KTU 1.1–1.2 (Vetus Testamentum Supplements series, volume 55; Leiden: Brill, 1994). _____. The Ugaritic Baal Cycle: Volume 2. Introduction with Text, Translation and Commentary of KTU 1.3–1.4 (Vetus Testament Supplement series, volume 114; Leiden: Brill, 2008). Co-authored with Wayne Pitard. Tubb, Jonathan N. (1998), "Canaanites" (British Museum People of the Past). Wyatt, Nicolas (1998): Religious texts from Ugarit: the worlds of Ilimilku and his colleagues, The Biblical Seminar, volume 53. Sheffield, England: Sheffield Academic Press, paperback, 500 pages. Wikimedia Commons has media related to Ugarit.